Two of the world’s 10 best-ranked racehorses have Southern Hemisphere trainers. The second best-ranked Winx is trained by Sydney-based New Zealander Chris Waller, while Australian John O’Shea of the Godolphin Stable is behind Hartnell, rated 8th. Waller’s and O’Shea’s prize horses are set to go head-to-head within weeks, but they are by no means the only trainers to watch this season on the Australian, New Zealand and South African racing scenes. Waller is best known for training Winx, who won the G1 Caulfield Stakes, G1 George Main Stakes and G1 Doncaster Mile in 2016 and the last two Cox Plates. Waller’s operations are far bigger than just Winx, though. His stables in Sydney and Melbourne train 120 active thoroughbreds, with a 13% win and 39% place rate overall. Since moving from New Zealand to Australia in 2000, Waller has won the Sydney Metro Trainers Premiership six times and been crowned Champion Australian Trainer three times, while he’s groomed 65 horses to G1 victories. In 2017, he’ll be focusing primarily on Winx winning April’s G1 Queen Elizabeth Stakes in The Championships at Sydney’s Royal Randwick Racecourse. O’Shea is the trainer behind Winx’s biggest rival, Hartnell, who won the 2016 G1 Turnbull Stakes. The North Queensland native also trained Astern to win the G1 Golden Rose Stakes at Sydney’s Rosehill track last September. 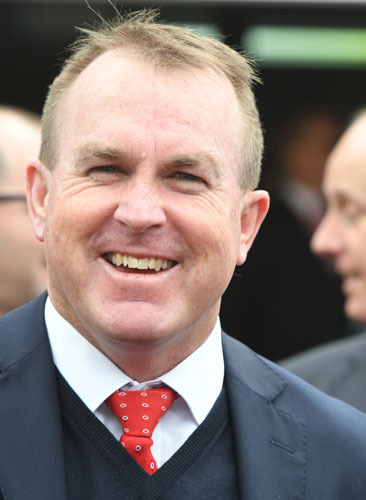 O’Shea is the Dubai-based Godolphin stable’s principal Australian trainer and horses he’s trained currently have an 18% win and 46% place rate. His 27 G1 wins include two Doncaster Miles and two Golden Roses. Currently second in the Premiership table, O’Shea’s main focus this year is unsurprisingly Hartnell. The second-best ranked Australian horse. Hartnell’s biggest upcoming race will be against Winx in the Queen Elizabeth Stakes. Waterhouse and Bott joined forces as co-trainers last August and their subsequent G1 victories with Global Glamour include the Flight Stakes at Randwick and The Thousand Guineas in Melbourne. The daughter of renowned Australian trainer Tommy Smith, Waterhouse has logged 133 G1 wins in her career, including the 2013 Emirates Melbourne Cup and six Golden Slippers. The 62-year-old has topped the Premiership seven times and is currently fifth in this season’s table with her new co-trainer. Bott was part of the prestigious Godolphin Flying Start programme and then joined Waterhouse, rising rapidly from racing assistant to his current role. The team have high hopes in 2017 for 3-year-old filly Global Glamour in the G1 Doncaster Mile and Queen of the Turf Stakes, both in April. The current leaders of the New Zealand Trainers Premiership are Murray Baker and Andrew Forsman. They’ve had 61 wins this season and are hoping for a first at the G1 Futurity Stakes at Caulfield in Melbourne on the 25th February with Turn me Loose. Other top Kiwi trainers include 2015/16 premiership winners Steven Autridge and Jamie Richards, whose Risque has been nominated for this year’s G1 Australian Cup, Doncaster Mile and Queen Elizabeth Stakes. Sean Tarry is leading the Trainers Premiership with 114 wins, which include the G1 Queen’s Plate with Legal Eagle, the 2016 Equus Horse of the Year. Second-placed trainer is Justin Snaith, whose 101 season wins include the G1 Paddock Stakes at Kenilworth with Bela Bela, giving her automatic entry into the Breeders’ Cup Classic this November. Whether or not the 4-year-old filly runs, she’s certain to rise in the Durban July at Greyville this summer. US race fans can follow these trainers’ entries every week at Sky Racing World. which features live racing and video replays. All upcoming regional races can be live-streamed via ADWs such as TVG, TwinSpiresTVG, TwinSpires, Xpressbet, BetAmerica, WatchandWager, and NYRA Bets and HPiBet.